Butera Market weekly sales, valid April 17 – April 23, 2019: California Premium Strawberries 1 lb pkg; US Gov’t Insp. Boneless Skinless Chicken Breast or Thighs; US Gov’t Insp. Whole Fryers; Nabisco Oreos; Deli Sliced Polish Style Ham; USDA Choice Certified Angus Beef Boneless Chuck Steak; Pre-Sliced Hard Salami; US Gov’t Insp. Boneless Ribeye Steak; US Gov’t Insp. Boneless Center Cut Pork Chops; Genova Tonno Tuna; Yoplait Fridge Pack Yogurt; Blue Bunny Ice Cream; Fresh Eclairs; Italian Delight Cake; US Gov’t Insp. Bone-in Country Style Ribs; US Gov’t Insp. Boneless Center Cut Rolled Pork Roast; Fresh Wild White Bass; Fresh Wild Cod Fillets; Farm Raised Tilapia Fillets; Palermo’s Pizzeria Pizza; Michigan Green Peppers; Cauliflower; and more. 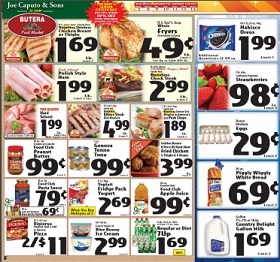 Find all deals and offers in the latest Butera Market Weekly Ad for your local store.